Why do Epidurals not work for some People? So lately I’ve been struggling with a very important issue when it comes to delivery. I am on the fence as to whether or not I should have an epidural. On the West Coast and especially in Utah it is very common for most women to opt to get an epidural for delivery. I myself received an epidural for my labor with Jackson and was planning to have one when I delivered Jayne as well. Each birthing story is a little different and you never know what you are going to get. With Jackson I was induced because of being pre-eclamptic. My labor was induced at about 1 pm in the afternoon and I delivered him the next morning. During that time I was given an epidural and it was just okay. Right after receiving the epidural I felt like a champ and was so excited that my epidural was working. Then as the labor progressed it wasn’t working quite as well. I used the pump that they give you to administer more medication and the anisethiologist even came back and put two direct doses into my line to help ward of the pain but it didn’t do a whole lot. I will say in the last 15-20 minutes or so of my labor it did kick back in (thankfully) and I was able to enjoy the last part of my labor without too much pain. Fast forward a few years and I had spontaneous labor with my water breaking 12 days early with Jayne. It was New Years Eve and to our surprise we were heading to the hospital to deliver our baby girl. I was hooked up to an IV immediately but wanted to experience labor for a bit before getting an epidural. When I was dilated to a 4-5 I decided it was time to ask for an epidural because I progress rather quickly when I get to that point. I rang for the nurse and she came in to tell me that I was out of luck because the one anesthesiologist they had working that day was stuck in a c-section and would be busy for an hour. She reassured me that things should be fine because this was only my second baby and he would be done before I would know it. Well, in that hour things changed A LOT. I was surprised by how similar my contractions were to the time I delivered Jackson when I HAD an epidural. They felt almost exactly the same! I can do this, I thought as I progressed to a 6-7. I thought by the time I got to an eight the anesthesiologist would be ready to help me out but he was still stuck in surgery. I was progressing very quickly and all the nurse could do for me was shoot a drug into the IV that made me dizzy and light headed (a lot like the feeling you get when you are being gassed at the dentist.) It did nothing for the pain. Because I was expecting to receive an epidural I was strapped to the bed with NO movement and no tools in my belt as far as coping with the pain in ways that you see women doing in birthing videos: swaying, taking a bath, taking a shower, bouncing on a delivery ball, and using meditative breathing techniques. NOTHING. I was NOT prepared to get through this pain. When I was at a 9? the anesthesiologist shows up and asked if I wanted to receive an epidural or not. By that point I was in the thick of it and really couldn’t think straight. I told Paul to make the decision for me. Poor guy, Paul is so supportive and amazing but he gets woozy at just the sight of blood, needles, and painful looking situations. He said, “Let’s try it.” So we tried. Right after he was done placing the catheter I was told it was time to roll over and push but I wasn’t ready. I was so tired and so hoping for some relief. The anesthesiologist waited by and said, “you should be feeling some relief soon” to which I replied in an animalistic manner “IT IS WORSE THAN EVER!” It was working at all. It was time to push. They took the catheter out realizing by that point it was too late for the medicine to work its magic. This is when things became REALLY hard. You hear about the “RING OF FIRE” well, Johnny Cash was right when he says it “BURNS, BURNS, BURNS.” This was the point of my labor that I knew my epidural HAD worked with Jackson because this pain was insane. I am ever so grateful that I had a nurse that got in my face and helped me get through this part of my laboring. She was like a drill sergeant yelling “You can do this! We need TWO more BIG pushes….” I was physically wiped out. Jayne was sunny side up but thankfully came through in 10 minutes. I don’t know how much longer I could go. Once she was born I literally could not lift up my arms. They didn’t give her right to me because her face was bruised and they thought she wasn’t breathing well. But even five minutes later when she was wrapped up and ready to go I couldn’t hold her. My blood pressure had dropped so low they thought I was passing out. After the initial recovery of just relaxing for a while I started to feel much better and was shocked when they welcomed me to get out of bed and walk to the wheel chair. WhAT?! Oh, yeah, I wasn’t numb and it was great. The trauma of being unprepared kept me up most of that first night. My mind and body kept replaying the scenes over and over in my head again of the unexpected marathon it just went through. So why would I ever consider to go natural again? *pain medication doesn’t work well for me: I awoke when having my wisdom teeth removed, when I had surgery on my hand I felt everything and they doctor was SHOCKED and said I should have been put out. *What if epidurals just don’t work for me? So there you have it…with all of this being said I have also been researching natural child birth and will share some of what I have found about that here as well. 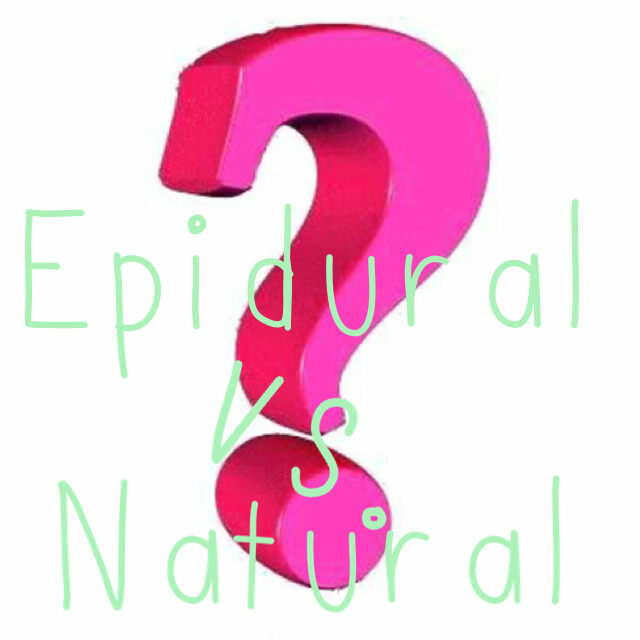 What are your thoughts and experiences with epidurals vs. natural? Please comment and tell me about it! You have been through so much! Because you have experienced an emergency C-section are they planning for you to have a planned c-section this time around? I know that decision will be made in large part to how your incision was made and if they were able to deliver the baby with just one incision or two. I have family and friends who have planned c-sections for this very reason and have a wonderful experience with it. Maybe this would be a good option for you as you haven’t had a great experience with epidurals and c-sections are done using a spinal block. If you were further away from your due date I would refer you to Hypnobabies as that is what I did with my last delivery and had such an amazing experience using no drugs at all. Unfortunately this takes time and preparation and with you being in your ninth month you probably wouldn’t have time to prepare adequately. I had epidural with all 3 of my kids. The first one worked 100% and it was amazing, I basically slept until I was at 10cm and then pushed for about 1.5 hours. No pain, no discomfort. I had to look at the monitor to see when to push. Both second and third baby hurt so bad. I got epidural at 4cm for all 3 of them. It took away the contraction pains but when they started to drop and go through the birthing canal it was the most excruciating pain I ever felt. The epidural didn’t work on it at all. The anesthesiologist came several times to up my dose and nothing worked. Luckily this only lasted for about 30 minutes and then instead relief once baby got out. Sorry to hear about your trials… I just wanted to chime in that my first epidural didn’t really work (the doctor tried to insert the catheter twice, and kept giving me more meds, and it only resulted in my arms and legs being numb – but I could still feel everything in my mid-section and as I delivered – and it made it really hard to push. UGH. With my first, the epidural wore off after about 20 minutes. The resident re did it a few times during my 26 hours of hell plus a spinal and nothing worked for me. I had been induced bc my water broke. Also baby was sunny side up. By a 9 cm I just couldn’t take another minute and was begging to be put out, I also felt extremely hot like on fire, begging to have water dumped on me. it was taking hours and I wasn’t dilating further so I had c section, they had to put me out. The last couple contractions on the operating table were unbelievably painful, there’s no way I could have done any more. I ended up getting a spinal headache the day we went home. Had to go back in for another epidural to take it away. With my second I tried a vbac as I thought it was the residents fault it didn’t work with my 1st. But it didn’t work again! And baby was sunny side up again!! So i opted for c section. The spinal also didn’t work enough to numb me when testing me before cutting so they had to put me out again.